Solo Stove Campfire - 4+ Person Compact Wood Burning Camp Stove for Backpacking, Camping, Survival. Burns Twigs - NO Batteries or Liquid Fuel Gas Canister Required. Designed with a double wall, the patented (#D701,721) Solo Stove Campfire is a natural convection inverted downgas gasifer stove. The air intake holes on the bottom of the stove channels air to the bottom of the fire while at the same time, channels warm air up between the walls of the stove. This burst of preheated oxygen feeding back into the firebox through the smaller holes at the top of the stove causes a secondary combustion. This allows the fire to burn more complete which is why there is very little smoke during full burn. A more efficient burn also means you'll use much less wood compared to an open camp fire. The Solo Stove Campfire doesn't just burn wood. It actually cooks the smoke out of the wood and then burns the smoke not once, but twice! The Solo Stove Campfire also features a heat shield between the ash pan and the bottom of the stove. This heat shield protects the ground under the stove from scorching. The cooking ring's angled lip also increases efficiency by directing heat towards your pot minimizing heat loss. It also acts as a windshield while still allowing oxygen to flow inward. The Solo Stove Campfire is indeed one of the most efficient wood burning stoves you'll ever own. Your Solo Stove Campfire is made by using a one piece construction process. This manufacturing process allows us to use state-of-the-art precision presses to form and shape solid pieces of high grade stainless steel. 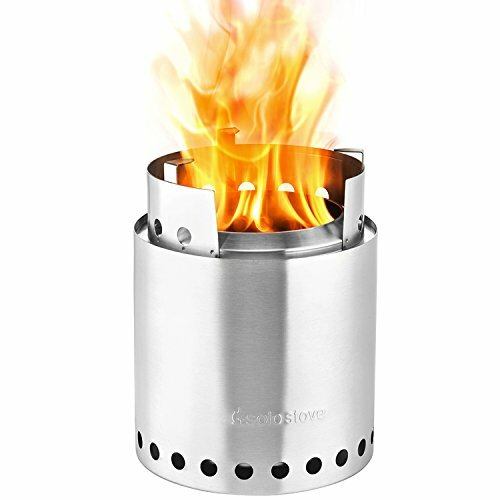 The outer shell of your Solo Stove Campfire is actually one entire piece of stainless steel with no seams or welds. The inner firebox and floating ashpan is also made using one piece construction. This eliminates the need for excessive welding and increases the overall strength and lifespan of your stove. Nichrome wire, which has a high melting point of 2552 degrees Fahrenheit, is used for the grate. The #1 wood-burning camp stove recommended by Backpacker Magazine and serious survivalists including Discovery Channel's Matt Graham. Patented design (#D701,721) features a unique double wall that creates ultra-clean gasification and a secondary combustion. This allows fuel to burn more completely and with less smoke. Uses twigs, leaves, pinecones and wood as fuel. Eliminates the need to carry heavy, polluting and expensive canister fuels. Compact design nests inside the companion Solo Stove 2 Pot Set (sold separately) leaving you with more room in your backpack. Boils water in 2-4 mins (34 fl oz water). 7" Diameter, 6.7"/9.25" tall (packed/assembled). Weighs only 2.2 lbs. Made of premium stainless steel and nichrome wire. Nylon stuff sack included.